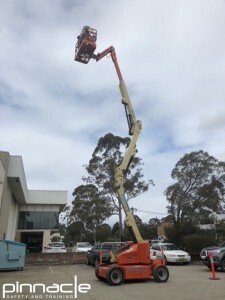 Provides participants with the knowledge and skills to operate an elevating work platform (EWP) with a boom length over 11m, and undertake the assessment required to receive their high-risk work licence. Participants who are deemed competent will receive a Statement of Attainment recognised under the Australian Qualifications Framework. This certification is nationally recognised. The Statement is issued by Pinnacle Safety and Training (RTO 40496). Two days. The course is composed of one day theory and practical training, with all assessment taking place on the second day. Special Introductory Price $395.00 pp for public courses. Book online and save $10.00! (scroll up, find your date, and click Book Now). Q: What is the assessment process? 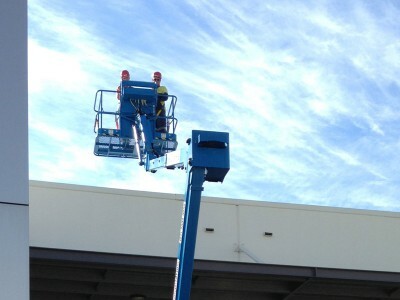 A: Our Western Australian EWP course is made up of one day of training and one day of assessment. 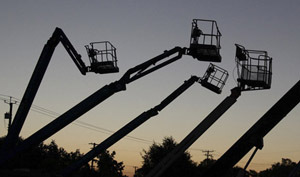 Participants will be required to successfully complete a series of WorkSafe mandated assessment items. On day two you will undergo written knowledge and calculations assessment and (if eligible) you will undergo a practical skills assessment. All assessments will be “closed book” and conducted by a WorkSafe WA Accredited Assessor (who is independent of Pinnacle Safety and Training). This mandated assessment is required to be administered by all RTOs offering this High Risk training. Q: How do I apply for my High Risk Work Licence (HRWL)? A: Upon successfully completing your training and assessment with Pinnacle Safety and Training, you must lodge your application form and pay your licensing fee within 60 days of the date of your notice of satisfactory assessment. Q: Will I be able to use my High Risk Work Licence in other states/territories? A: Yes. A current High Risk Work Licence may be used anywhere in Australia regardless of which state or territory it was issued in. Q: What do I need to bring to my training? Q: I failed one or more of the assessments. What does this mean for me? Can I come back and re-sit them? A: Not everyone passes the first go – don’t be embarrassed if this happens. 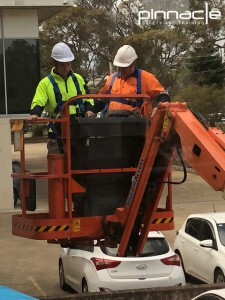 Even knowledgeable people may struggle to answer the technically specific exam, as the answers need to be provided precisely in accordance with WorkSafe WA standards. If this occurs, you may study the material in your own time, and return within 60 days to re-sit the assessment, at a cost of $198. Q: I attended part of the training, and I now no longer wish to proceed with any more training or assessment. Can I have a refund? A: No. The course fee you paid relates to the formal training you have already received. If you choose not to proceed with this for any reason, no refund or partial-refund will be provided. This is in accordance with our standard Terms and Conditions you accept upon enrolment. On assessment day, we limit numbers to seven participants to optimise amount of 1:1 time and practical training. Be ready and willing to study, memorise and complete review questions at night in order to have the best chance of successfully completing the written assessment. If English is your second language, you must advise us at time of booking. 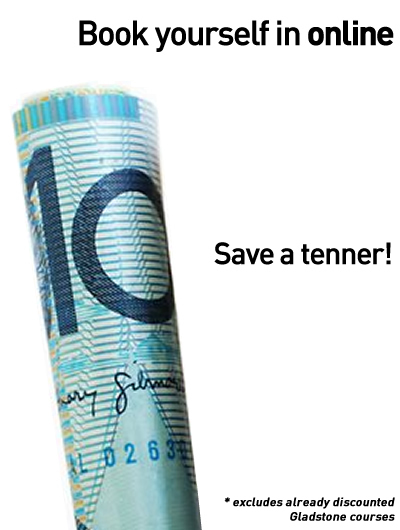 Contact our Sales and Service Team on 1300 990 810 to determine your eligibility to undertake this training. We will assist you in any way we can, but due to the demands of the WorkSafe Vic assessment process, do not guarantee that every applicant will possess the level of LLN required for the assessment. You will require at least a Year 10 level of numeracy, literacy and communication skills. If you have any doubts, please let us know so we can assist you. The Regulator does not allow an interpreter to be used during the mandated formal assessment. I have undertaken Forklift and Boom tickets with Pinnacle. Both times I was lucky enough to have Brad as the trainer. He is very knowledgeable, professional, detailed and clear in his training. Thanks again Brad and the Pinnacle team. We will be sending more staff to your courses. Thanks to your team. Also good to see a real course where you do learn and have to earn the qualification rather than just get approved because you “turned up”. Hopefully this will keep the level of the people in the industry at a high quality and will actually mean the qualifications hold some value in the workplace. Peter was an excellent trainer with immediate answers to all the questions asked. He had a strong knowledge of the course content. Even when it came to queries I had about WorkSafe (which were outside the scope of the course), he went out of his way to find out the answers for me. Was very pleased with both the standard and the delivery of the course.